PITTSBURGH – Understandably there was a lot of buildup to the signing of Tucker Poolman last spring and his subsequent arrival at training camp this fall. Even coming off double shoulder surgery this past off-season he was a player – a defenceman no less – that arrived with major promise because of his size, puck moving and scoring ability and high-end hockey sense. It also didn’t hurt that he hails from East Grand Forks, Minn., and played just two hours south of Winnipeg at the University of North Dakota the last three seasons. As such, he was certainly under close scrutiny by Winnipeg and their fans because of proximity since being selected by the Jets in the fifth round (127th overall) in the 2013 entry draft. And clearly to this very early juncture in the regular season he hasn’t disappointed. In fact, he’s likely exceeded some expectations, especially considering he forced the team into including him on the opening night roster with his exceptional play during the preseason. Moreover, after sitting for the first of seven scheduled exhibition games, he suited up for the second and then every game after that because his play dictated it. The Jets’ coaching staff quickly became so enamored with him during the exhibition schedule that they even experimented by using him on the left side of the ice to explore his versatility. There again, even as a right-handed shot, he didn’t disappoint. Overall, his play thus earned him a shot to make his NHL debut as the first depth defenceman to be inserted into the lineup (even ahead of veteran Ben Chiarot) earlier this month against Edmonton when Dustin Byfuglien wasn’t able to play due to a lower-body injury. Over the past two seasons especially, the Jets have learned that having extra D-men around is more than a luxury. It’s become a necessity for the club when you look historically at the injuries they’ve experienced on the blueline going back the last three seasons. Poolman, 24, provides the team with roster options and utility, significant not only for this season but also in the team’s near and exciting future. Looking ahead, all signs point to the fact that veteran defenceman Toby Enstrom won’t be re-signed after his contract expires at the end of this season and with Byfuglien inching toward his mid-30s, Poolman appears to be an impactful part of the future on Winnipeg’s backend. In addition, Jacob Trouba will also be coming off a bridge-deal contract after this season. He could be a restricted free agent for the second time in two summers if he and the Jets are not be able to come to an agreement beforehand on another contract, only this time for something expected to be longer than a couple of years. Now, Poolman himself is also set to become an RFA on July 1, meaning he’s in line for a raise, but there’s little doubt the Jets won’t make a qualifying offer and try to get him signed long term. He’s already become too valuable for that to not happen in such a short period of time and provides them with stability and some interesting depth. 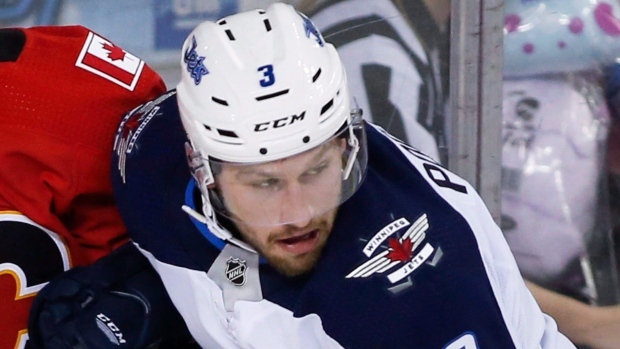 It remains to be seen if Poolman spends all season with the Jets or finds himself at some point down with the AHL’s Manitoba Moose to ensure he continues to develop by playing significant minutes and in all situations. But for right now, he’s earned the opportunity to continue with the Jets as a depth player and one who provides options to the team should anything change today, tomorrow or next season. - Mark Scheifele, when asked if linemate and captain Blake Wheeler gets enough positive notoriety for his defensive contributions. - Head coach Paul Maurice, on the addition of forward Brendan Lemieux into his lineup last week against Minnesota and the edginess he provides to the team with his gritty style of play. NOTES: The Jets have quietly increased the capacity of BellMTS Place this year from what was a maximum seating attendance of 15,294 to 15,321. It doesn’t seem like a lot, but on the revenue side even conservative estimates would predict the increase would generate an extra $200,000 in gate and ancillary money. And when you’re the smallest market in the NHL every dollar counts….Head coach Paul Maurice has celebrated both his 500th and 600th career NHL wins behind the Jets bench. Entering this week’s back-to-back games with Pittsburgh and Columbus he now has 139 wins as Winnipeg’s bench boss….Tyler Myers is one point away from 200 in his nine-year NHL career….The Jets have three short-handed goals this season to tie with two other teams (New Jersey and Anaheim) for the league lead. Of those, Joel Armia has one to go along with his team-leading four from last season. That’s five shorties in his last 62 games.